The craze for fidget spinners is yet to die down. Manufacturers and innovators are not sitting pretty. 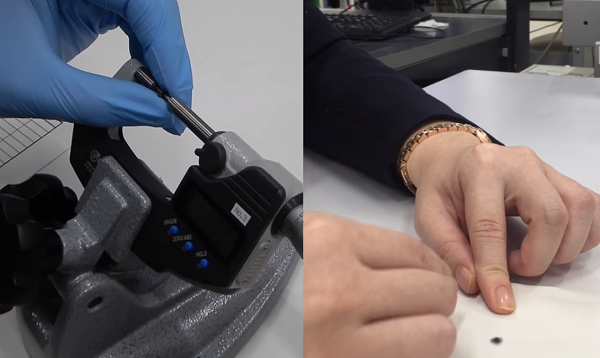 As you can see in the video below, one Japanese ball-bearing manufacturing company (MinebeaMitsumi Inc.) just broke the record for building the smallest fidget spinner. The company makes the world's smallest commercially available ball bearings, which they used to make the fidget spinner. The smallest ball-bearings measure just over 1.4mm and weighs a paltry 0.027grams a piece. Even though a teeny tiny fidget spinner observable under the micrograph has been 3D printed, Minebea Mitsumi's fidget spinner goes down the history books as the smallest functional fidget spinner. It is so small you need a tweezer to hold and spin it. According to Guiness World Records, it measures just 5.09mm or 0.2 inches from end to end. Amazingly, the company did not just stop at making the smallest fidget spinner. They also made a fidget spinner with the longest single spin. One of the company's employees broke the world record for the longest spin in one finger. The spin lasted over 24 minutes. Leveraging on their hi-tech proprietary technology for building space satelites, they were able to shave off extra weight by using only the highest quality alloys. They were able to achieve the smoothest spins, enabling the spinner to effectively outlast any other commercially available fidget spinner. The fidget spinner does not come cheap, though. It will set you back about $450 a piece.